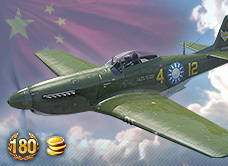 Premium Aircraft are planes that are acquired by purchasing them with gold, either through the Portal's gift shop https://na.wargaming.net/shop/wowp/?utm_content=premium-shop&utm_medium=link&utm_source=site&utm_campaign=wowp-portal, or from the game client Store. Some premium aircraft can be available as gifts from a special event, part of a promotion package or an incentive for new players. All Premium Aircraft start with an "Elite" status since they have nothing to research, and can not be upgraded further. Premium Aircraft are designed to add extra experience to pre-trained crews of the same nation and aircraft type, without a retraining penalty. Because of reduced repair and ammunition costs, premium aircraft earn credits at a higher rate than regular aircraft of the same tier. Grumman XF4F-3, Kochyerigin Sh (LBSh) and Messerschmitt Bf 110C-6, current page. Since it's the only premium Heavy Fighter currently in the game, that can be purchased, currently (and if you like the playstyle or just want a very good credit earner), it's almost a no brainer. For newer players or those who haven't tried Heavy Fighters before, I would recommend either playing up to the Bf 110B or even the Bristol Blenheim F to get a feel, before spending real world money on this (I bought one). A fast and exceptionally armed Attack Aircraft. Very good armor and can go air-to-air with surprising results. Select the 4xFAB-100 bomb option and load up on Armor Piercing Incendiary and watch the credits roll in (I didn't buy one, have the Pegas at tier 2 and a pre-order BSh-1 at tier 3). Playing a BSh-2 or if you have a pre-order BSh-1, will give you a "taste" of what this plane is similar to (except, you will have a rear gunner in this and the BSh-1). Excellent dive speed (even without boost). The only Soviet Attack Aircraft of the same tier, with a rear gunner. The mounted 20 mm ShVAK (1936) is unique to this aircraft. The mounted 7.62 mm ShKAS (1933) are shared with the Kochyerigin BSh-1. If you "bought" the tier 3 F2A-1 Buffalo in Beta for tokens, this plane is almost the same, but with double the guns! For newer players and those who haven't tried American Fighters, either try out the tier 3 Hawk 75 or the tier 4 F2A Buffalo to get a "better feel" of this aircraft. Like most American planes it can "Boom and Zoom" and "Turn and Burn" very well, but not exceptional in either one. Faster than it's fully upgraded tech tree counterparts (rated at 474. F2A Buffalo rated at 448, P-36 Hawk rated at 469, both with top engines installed). Good rate of climb (boosted and un-boosted). Weapons suffer a short heat cycle when firing. The mounted 12.7 mm M2 is also shared with the XF4U-1. The mounted 7.62 mm AN/M2 is shared with the Beta premium Brewster F2A-1, Chance-Vought XF4U-1 and pre-order Bell XFL-1. Now, if you were to buy any of these planes, you also get a pilot/crew trained to 100% in that aircraft. The bonus? Take any of your pilots of the same nation and aircraft type, and put them into the right plane (DO NOT RETRAIN THEM) and "double" their experience earned (be sure to select "accelerated crew training" to speed the process up, unless you want to convert the experience with gold at a later date). Also, if these planes are bought from the ingame store with gold, they DO NOT come with a hanger slot. Only through the Gift Shop packages are hanger slots included. Edited by Quesnel, 30 December 2014 - 06:26 PM. 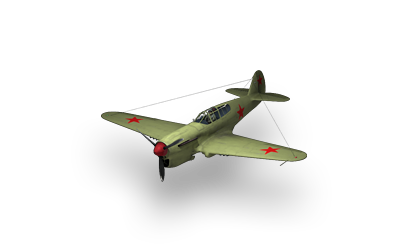 Currently, it's the only premium Soviet Fighter currently in the game that can be purchased. This aircraft is not only armed the same as the American Fighter P-40, it plays almost exactly the same. However, the major difference between these two aircraft is the Soviet version has a weaker engine/boost and lower operating ceiling. As with any Lend-Lease aircraft, if there is one from the nation of origin in a tech tree, the premium counterpart will be close in performance and other characteristics. Nearly matches the American Tier V P-40 Kittyhawk in maneuverability (M-105 rated at 282, optimal upgraded P-40 rated at 295). Able to carry rockets (4xRS-82 vs 6x4.5'' M8 on the P-40). Below average rate of climb (both boosted and un-boosted). The mounted 12.7 mm M2 is shared with the American F4F, F2A and P-40. The RS-82 rockets are shared with the Open Beta tester Pegasus (Pegas). 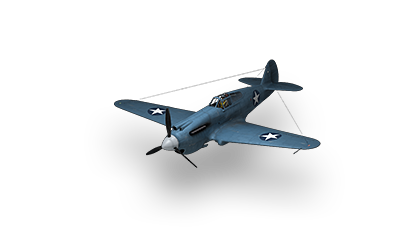 Update 1.2 P-40 M-105: increased optimum altitude. In a straight line, this has to be the fastest aircraft in it's tier, in any class. With below average hitpoints and maneuverability, it is highly recommended that targets are carefully considered for maximum effect, and an escape route from the encounter is planned. This aircraft is the "embodiment" of Boom and Zoom (along with the Messerschmitt Bf 110C-6). Playing the German Fighter Fock-Wulf 190 at tier V and/or a mid tier German/British Heavy Fighter will give a "pre-feel" for this aircraft. Exceptionally strong boost (can be used either vertically or horizontally). Boost duration of 20 seconds. Low hitpoints vs tech tree counterparts (rated at 150. Bf 109E starts from 200, FW 190V starts from 225). The mounted 20 mm MG-FF/M (H) are shared with the Bf 109B/E/F. 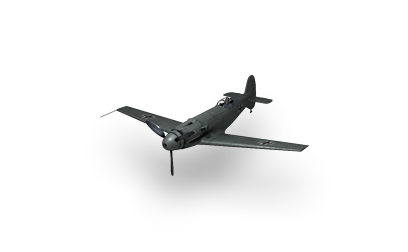 The mounted 7.92 mm MG-17 (1940) are shared with the Bf 109E/F/G, FW 190 V, FW 190 A-5 and the pre-order Ar 197. Update 1.2 Bf.209V: improved pitch controllability in a dive; increased weapons accuracy and burst length. A fast turning/banking British Fighter with a very low operational attitude. This aircraft has more in common with the low to mid tier Soviet Fighters than with the British Fighters this plane is designed to train the British pilots for. Despite having fixed landing gear, this plane has a strong element of speed and the firepower to make short work of those who underestimate it's potential. Slightly above average hitpoints vs tech tree counterparts (rated at 210. Optimal upgraded Tier V Spitfire I rated at 200). Excellent turning/banking within optimal performance altitude (boosted). Weapons enjoy a long heat cycle when firing. Below average energy retention (loses speed very quickly without boost). The mounted 303 Browning Mk.II (K) is also shared with the promotional Supermarine Type 224. The IL-2 (mod.) could be seen as either a tech tree tier VI IL-2 (t) being moved down a tier, or a regular tier V IL-2 finally getting a rear gunner. For players that have already experienced the IL series, starting from the BSh-2 and up, this plane holds no surprises. For players who haven't tried Soviet Attack Aircraft, it is highly recommended to try the BSh-2 before considering this as a purchase. While the guns are adequate for battles at it's tier, they begin to struggle in higher tier matches. Because of the low damage output of the FAB-50 bombs, ground targets with low hitpoints should be selected from maximum effect. Nearly matches the airspeed of the Tier VI IL-2 (t) (rated at 334. IL-2 (t) rated at 354 with top engine). Below average maneuverability and rate of climb ( boosted and un-boosted). The mounted 23 mm VYa-23 (W) are shared with the IL-2, IL-2 (t), IL-8 and IL-10. The mounted 7.62 mm ShKAS (1941) are shared with the IL-2, IL-2 (t), IL-8 and IL-10. The rear mounted 7.62 mm ShKAS (1941) is shared with the IL-2(t). The FAB-50 bombs are shared with the Pegasus, TSh-3, BSh-1/2, LBSh and IL-2. The ROFS-82 rockets are shared with the IL-2 and IL-2 (t). This prototype Corsair is much like the tech tree tier VI F4U-1, but detuned to fit in better at tier V. Excellent speed and climb, decent boost and slightly above average turning/banking with boost. 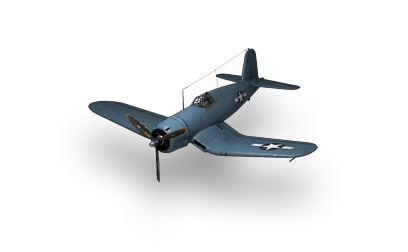 This Corsair brings to the battle a very good boost dive and good armor, which is the pleasant surprise with this aircraft. With having about average firepower within it's tier, damage output will be decreased in higher tiered battles. As fast as it's fully upgraded tech tree counterparts (rated at 555. F4F Wildcat rated at 495, P-36 Hawk rated at 556, both with top engines installed). The mounted 12.7 mm M2 is also shared with the Brewster F2A-1 and Grumman XF4F-3. The mounted 7.62 mm AN/M2 is shared with the Beta premium Brewster F2A-1, Grumman XF4F-3 and pre-order Bell XFL-1. Edited by Quesnel, 28 April 2014 - 04:39 PM. Tier III Polikarpov I-15bis DM-2 "Gift Aircraft". A special gift that was available August 2013, during the 15th anniversary of Wargaming. 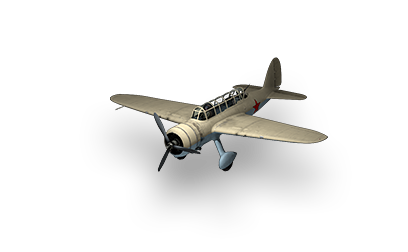 Basically, this aircraft is similar to a fully upgraded Tier II Polikarpov I-15, but with a different version of guns from the Tier IV Polikarpov I-16 (early mod.). This aircraft has exceptional "bursts" of speed and climb rate, due in part to the two lower wing mounted ram jets. Above average turn/bank and climb rate (boosted). 4 cowl mounted machine guns for greater accuracy. Long cool down time for the ram jets. Low hitpoint for it's tier (75). The mounted 4x7.62 mm ShKAS (1933) are shared with the promotion premium Polikarpov I-5 ShKAS. This is a unique aircraft and won't be restored if you decide to sell it and then change your mind. 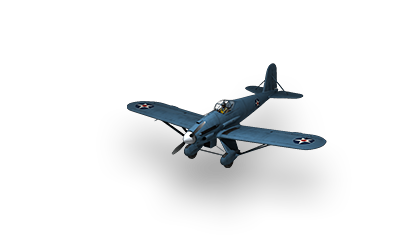 Tier III Brewster F2A-1 Buffalo Sale/Full price 850 tokens. With the 0.5.3 Open Beta update, a special tier III plane was offered through the ingame store. 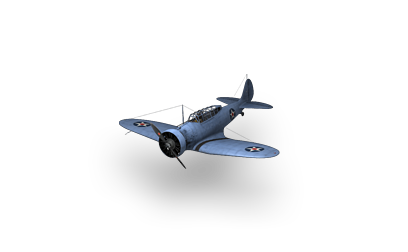 The Brewster F2A-1 Buffalo was the only premium aircraft that could be purchased during the beta test, and if it was in a player's hangar at the moment of the game release update, 1.0.0, it would be saved in the hangar after post-beta release. Very much the same as the Tier IV tech tree counterpart, but brought down to Tier III. Above average speed and climb rate (boosted). Above average hitpoints vs tech tree counterparts (rated at 160. 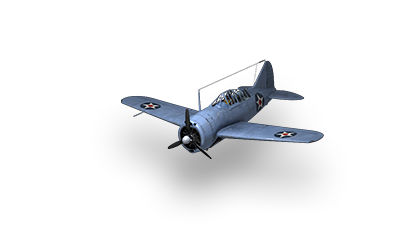 Optimal upgraded Tier III Grumman F3F rated at 115, Curtiss Hawk 75 rated at 125). The mounted 7.62 mm AN/M2 is shared with the Grumman XF4F-3, Chance-Vought XF4U-1 and pre-order Bell XFL-1. The mounted 12.7 mm M2 is also shared with the Grumman XF4F-3, Bell XP-77 and Chance-Vought XF4U-1. This plane is not available for purchase. Tier II Curtiss Hawk III "Gift Aircraft"
Made available in December 2013, the first Chinese aircraft was given to players who had an active account at the time. The Hawk III is very much like a slightly slower, slightly less maneuverable Curtiss P-23 of the same tier. Almost as fast as it's fully upgraded tech tree counterparts (rated at 319. Grumman F2F rated at 332, Curtiss P-23 rated at 330, both with optimal upgrades). The mounted 7.62 mm M1919 are shared with promotion premium Curtiss F11C. 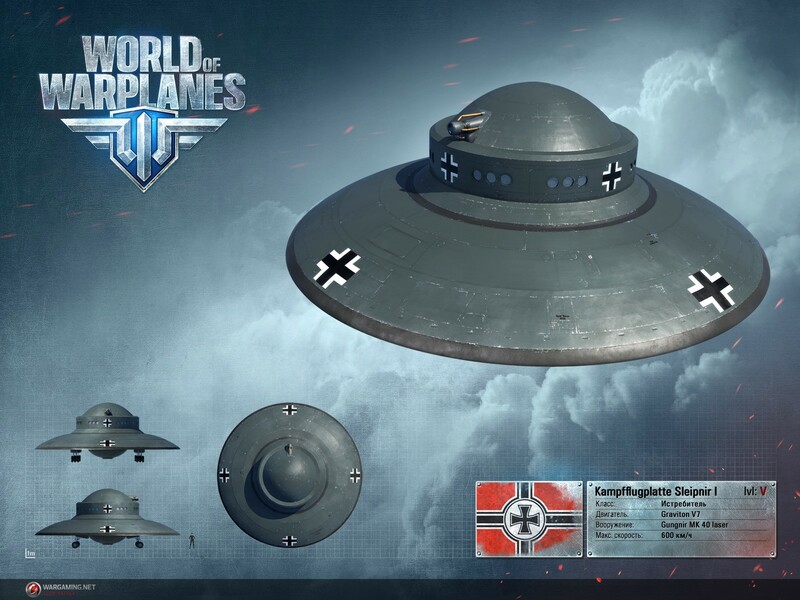 Tier V Kampfflugplatte Sleipnir I "Limited Time Promotion"
After updating the game client to version 1.2.3 on April 1, 2014, the Tier V German Kampfflugplatte Sleipnir I UFO was made available for free to all players. Although designated as a Fighter, it can best be characterized as having "very unique" flight qualities, shared by no other tech tree and/or premium aircraft currently ingame. "Cosmic" boost, with exceptional straight line, dive and climb rate (when boosted). Flies like nothing else in the game. Below average firepower and gun accuracy. The mounted Gungnir MK 40 Laser Gun is exclusive to this............um................aircraft. 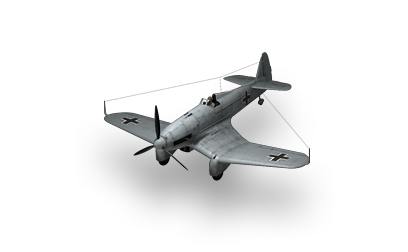 *Note* After a game client update on April 4, 2014, the Kampfflugplatte Sleipnir I was removed from the game, however, the pilot was placed in the barracks. 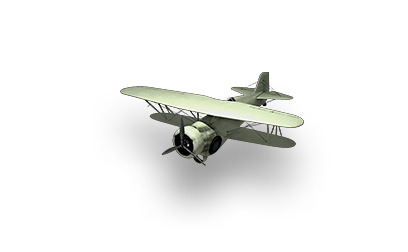 Tier IV Curtiss Model 81A-1 "Gift/Mission Aircraft"
Available during the "Earning your Wings" Mission, during E3 2014. The Model 81A-1 is a lighter than stock tier V P-40 brought down to tier IV, with less firepower and more maneuverability. Equal rate of climb with tier V counterpart (rated at 13.5, before upgrades). Equal hitpoints with tier V counterpart (rated at 210, before upgrades). The mounted 12.7 mm M2 (S) is shared with the Bell XP-77, P-39Q-15, Brewster Buffalo F2A-1, Curtiss P36C and Tomahawk IIb. Tier V Hawker Hurricane IID "Gift/Mission Aircraft"
This iconic British legend was the reward for completing the "Rock you like a Hurricane" Mission, for the month of September 2014. When originally released, the Hurricane IID was classed as an Attack Aircraft, but was latter rebalanced as a Fighter. Highest rated firepower among tier V British Fighters (rated at 185. Miles M.20 rated at 91, Supermarine Spitfire I rated at 131, with optimal upgrades). Below average airspeed (rated at 469. Miles M.20 rated at 483, Supermarine Spitfire I rated at 522, with optimal upgrades). Below average maneuverability (rated at 282. Miles M.20 rated at 303, Supermarine Spitfire I rated at 328, with optimal upgrades). The mounted 40 mm Vickers S cannons suffer from a very short firing cycle. The mounted 40 mm Vickers S Mk.I (O) are exclusive to this aircraft. The mounted 303 Browning Mk.II (W) is shared with the Bristol Type 133, Bristol Type 146, Miles M.20, Supermarine Spitfire I, Supermarine Spitfire V, Supermarine Spitfire IX and Supermarine Type 224. Tier III Boeing YP-29 "Gift/Mission Aircraft"
Intended as a "evolution" of the famous Boeing P-26 Peashooter, this aircraft was cancelled after four prototypes were constructed. First made available as a Mission reward for the "Rare Challenge" event in October 2014. Above average armor for a Fighter for it's tier. Above average maneuverability among tech tree tier III mono-wing Fighters (rated at 366. A5M rated at 409, with optimal upgrades). Below average rated firepower among tech tree tier III mono-wing Fighters (rated at 30. Blackburn Skua rated at 48, A5M rated at 49, with optimal upgrades). Low operational altitude (rated at 850, only the A5M comes in lower at 800). The mounted 7.62 mm M1919 are shared with Curtiss F11C, Curtiss Hawk II/III, Curtiss XP-31 and P-36C. The mounted 12.7 mm M2 (S) is shared with the Bell XP-77, P-39Q-15, Brewster Buffalo F2A-1, Curtiss Model 81A-1, P36C and Tomahawk IIb. Tier III Blohm und Voss Ha 137 "Gift/Mission Aircraft"
Not only does an all new premium Attack Aircraft come to WOWP, but this time, it's from Germany! Available as the final Mission reward completing the "Mystery Mayhem" event in October/November 2014. Above average firepower compared to other Attack Aircraft of the same tier (rated at 102. Kochyerigin BSh-1 rated at 59, TSh-3 rated at 99, with optimal upgrades). Surprising level of airspeed, dive speed, rate of climb and maneuverability for an Attack Aircraft. The mounted 7.92 mm MG-17 (1934) (S) are shared with Focke-Wulf Fw 56 Stosser, Blohm und Voss Ha 137 and Ha 137 V-1. The mounted 20 mm MG-FF (W) is shared with the Blohm und Voss Ha 137, Ha 137 V-1 and Arado Ar 197. The optional SC-50 bombs are shared with Blohm und Voss Ha 137, Ha 137 V-1 and Arado Ar 197. Tier II Curtiss XP-31 Swift "Gift Aircraft"
During the 1st Year Anniversary, in November 2014, this American Fighter was given to players who logged into an active account at the time. 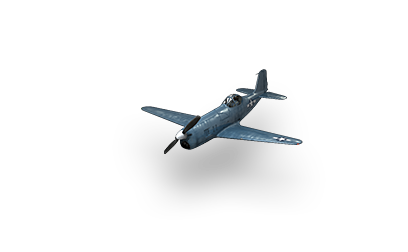 The XP-31 is the third tier II premium monoplane (after the Tomashevich Pegasus and Focke-Wulf Fw 56 Stosser) to be added to the game. Above average firepower when compared to tech tier peers (rated at 35. Bristol Bulldog and Arado Ar 68 both rated at 34, with optimal upgrades). Above average airspeed (rated at 333. Curtiss P-23 rated at 328, Arado Ar 68 rated at 327, both with optimal upgrades). Above average rate of climb and dive speed. Below average maneuverability, turn time and controllability. The mounted 7.62 mm M1919 are shared with Boeing YP-29, Curtiss P-36C Hawk, Curtiss F11C-2, Curtiss Hawk II and Curtiss Hawk III. 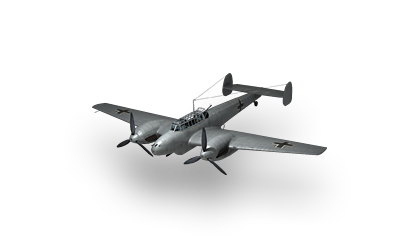 Tier III Dornier Do-17Z-7 Kauz "Gift/Reward Aircraft"
During the "Christmas Quests and Rewards" event of December 2014, the opportunity to acquire this premium companion to the tech tier Focke-Wulf Fw 57 was available. Above average airspeed (rated at 390. Focke-Wulf Fw 57 rated at 346, with optimal upgrades). Below average hitpoints (rated at 320. Focke-Wulf Fw 57 rated at 370, with optimal upgrades). Slightly below average firepower (rated at 120. Focke-Wulf Fw 57 rated at 128, with optimal guns installed). Below average maximum altitude (rated at 1000 metres. Focke-Wulf Fw 57 rated at 1250 metres). The mounted 7.92 mm MG-17 (1934) ( C ) is shared with the Ao 192 Kurier. The mounted 20 mm MG-FF is a variant shared with the Focke-Wulf Fw 57. The mounted 7.92 mm MG-15 rear gun is shared with the Focke-Wulf Fw 57. The optional SC 100 bombs are shared with the Focke-Wulf Fw 57. 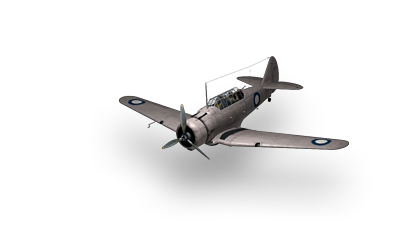 Tier III CAC CA-1 Wirraway "Gift/Reward Aircraft"
Made available through the March 2015 "Challenge of the Wirraway" event, this beloved Australian aircraft joined the British tree as a prelude for a future ground attack line. Tied with Blohm und Voss Ha 137 and V-1 for above average dive speed, stall speed and operational altitude (rated at 450, 100 and 400 meters in their respective categories, with full upgrades). Long heatcycle for mounted weapons. Mounted weapons have a short effective range (650 meters). Slightly below average firepower (rated at 44. Kochyerigin BSh-1 rated at 59, Kochyerigin TSh-3 rated at 99, with optimal upgrades). The mounted 303 Vickers Mk.V ( S ) are a faster firing variant of the Vickers Mk. III ( W ) found on the Blackburn Skua. The mounted 303 Vickers K rear gun is shared with Bristol Blenheim F. The optional 250lb bombs are shared with the Blackburn Skua, Bristol Blenheim F, Bristol Beaufighter and De Havilland 98 Mosquito. Edited by Quesnel, 08 March 2015 - 09:29 PM. Tier II Tomashevich Pegasus Alpha/Closed Beta/Open Beta with 700 battles. The Pegasus could be considered to be a twin engine mono-wing version of the same tier Kochyerigin TSh-2. Although it's slow and has poor maneuverability, the Pegasus can deliver a nasty surprise to unsuspecting opponents. With the option of the 9xRS-82 rockets mounted, enemies who choose to take this aircraft headon, could have their battle time cut short. Main gun has a long heat cycle when firing. Below average engine power and boost strength. The mounted 12mm UB © is unique to this aircraft. The FAB-50 bombs are shared with the TSh-3, BSh-1/2, LBSh, IL-2 and IL-2 (mod.). The RS-82 rockets are shared with the Tier V P-40 M-105. Tier V Bell XP-77 Alpha/Closed Beta with 700 battles. Having less in common with it's American tech tree counterparts, this aircraft performs quite well within it's operational attitude band. This plane has almost the same characteristics in firepower and performance to a newly purchased tier V Yakovlev Yak-1. Slightly above average turning/banking (boosted and unboosted). Below average rate of climb (un-boosted). Below average hitpoints vs tech tree counterparts (rated at 160. P-40 starts at 210, F4F starts at 235). The mounted 12.7 mm M2 is also shared with the Brewster F2A-1, Grumman XF4F-3 and Chance-Vought XF4U-1. The mounted 20 mm Hispano-Suiza HS.404 is unique to this aircraft. Tier V Messerschmitt Me 210 Alpha with 700 battles. The Messerschmitt Me 210 is very much along the same lines as a stock tier VI Me 410 Hornisse, brought down a tier. While nearly on equal footing with the same tiered Messerschmitt Bf 110 E, it does have a slight edge in turning. Slightly above average hitpoints in it's class (rated at 375. Bf 110 E rated at 360, Bristol Beaufighter rated at 370). Slightly below average firepower in it's class (rated at 274. Bf 110 E rated at 291, Bristol Beaufighter rated at 276, both with optimal upgrades). The mounted 7.92 mm MG-17 (1940) is shared with the premium German Heavy Fighter; Messerschmitt Bf 110 C-6. The mounted 13.2 mm MG-131 rear gun is shared with the Messerschmitt Me 410 Hornisse. The mounted 20 mm MG-151/20 (1941) is a variant shared with the Messerschmitt Me 410 Hornisse. The optional SC250 bombs are unique to this aircraft. Edited by Quesnel, 28 April 2014 - 04:43 PM. Having more in common with the tier IV BSh-2, then with the same tiered TSh-3, this fast Attack Aircraft can speed into an enemy area, drop the optional 8 bombs and take on a "limited" air-to-air role with ease. Above average hitpoints in it's class (rated at 440. TSh-3 rated at 375). Slightly above average straight line and diving speed. Slightly below average firepower in it's class (rated at 54. TSh-3 rated at 87, with optimal upgrades). Slightly below average maneuverability and turning/banking. The mounted 7.62 mm ShKAS (1933) (W) are shared with the LBSh. The mounted 7.62 mm DA rear gun is unique to this aircraft. The FAB-50 bombs are shared with the Pegasus, TSh-3, BSh-2, LBSh, IL-2 and IL-2 (mod.). 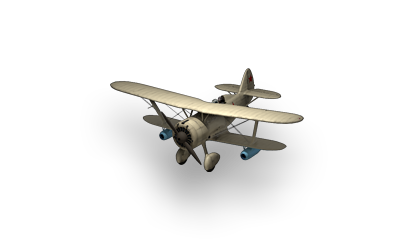 Currently, the only bi-plane at tier IV, this aircraft can be quite devastating at the lower altitudes, rivaled only by some of the same tier Soviet and Japanese Fighters. Above average hitpoints in it's class (rated at 160. He 112 rated at 135, Bf 109 B rated at 150,with optimal upgrades). Slightly above average maneuverability and turning/banking (within operational altitude). Slightly below average climb rate. The mounted 7.92 mm MG-17 (1940) are shared with the Me 209 V, Bf 109E/F/G, FW 190 V, and FW 190 A-5. The mounted 20 mm MG-FF is unique to this aircraft. The optional SC50 bombs are shared with the Ao 192 and Bf 110E. Having greater firepower than other premium ( and tech tree counterparts) Fighters of the same tier, the XFL-1 is very much the tier VI Bell P-39 Airacobra brought down a tier. Above average firepower vs tech tree counterparts (rated at 138. Curtiss P-40 and Grumman F4F both rated at 89, with optimal upgrades). Slightly below average climb rate and speed. Slightly below average weapons accuracy. The mounted 7.62 mm AN/M2 is shared with the Beta premium Brewster F2A-1, Grumman XF4F-3 and Chance-Vought XF4U-1. The mounted 37 mm T9 is unique to this aircraft. Oh Heck I'll reserve a chat space too then! North America server Promotional Aircraft. 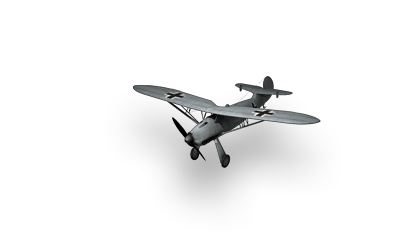 Tier II Focke-Wulf Fw 56 Stosser "Promotional"
This aircraft was first made available to players who had codes from the Gamescom 2013 WOWP giveaway. Later, new players could redeem a code for it from the premier "digital issue" of "Let’s Battle – The Official Wargaming Magazine". Starting on April 30th 2014, it was included as part of a limited time Paypal offer from the Giftshop. Above average maneuverability vs tech tree counterparts (rated at 395. 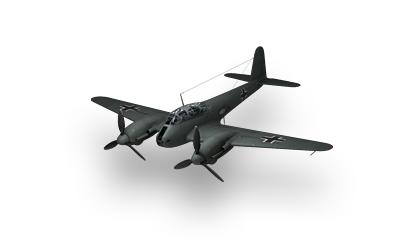 Heinkel He 51 rated at 393 and Arado Ar 68 rated at 371, with optimal upgrades). Long heat cycle for weapons when firing. Slightly below average air speed. Slightly below average hitpoints for tier. The mounted 2x7.92 mm MG-17 (1934) (S) is shared with the Arado Ar 68, Arado Ar 80, Heinkel He 51, and Focke-Wulf Fw 159. 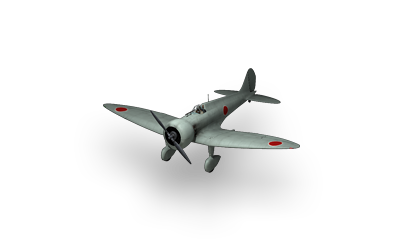 Tier III Mitsubishi Ki-33 "Promotional"
First offered as part of a limited edition t-shirt bundle from J!NX, the Ki-33 is a lighter, faster but slightly less maneuverable variant of the same tier Mitsubishi A5M. Above average maneuverability (just below A5M). The mounted 2x7.7 mm Type 97 Model 1 (S) is shared with the Mitsubishi A5M, A6M1 Reisen, A6M2 Reisen and A6M5 Reisen. Tier III Supermarine Type 224 "Promotional"
The Type 224 is, for all intents and purposes, a tier V Spitfire in tier III clothing, and was made available from Razer, PCGamesn, Spong and various other sites. Above average maneuverability vs tech tree counterparts (rated at 353. Bristol Type 133 rated at 350, Blackburn Skua rated at 317, with optimal upgrades). Large size for a fighter. The mounted 303 Browning Mk.II (W) is shared with the Bristol Type 133, Bristol Type 146, Miles M.20, Supermarine Spitfire I, Supermarine Spitfire V and Supermarine Spitfire IX. The mounted 303 Browning Mk.II (С) are unique to this aircraft. Tier II Curtiss F-11C "Promotion Aircraft"
Released as part of a Paypal promotion package on April 17th, 2014, the F-11C is currently the only premium aircraft that can be "tried out before purchased". Through the game client, select "Training Missions" and go to Lesson 3: Team Air Combat. The aircraft you will use during this scenario is the F11-C (without the bomb). On August 8th, 2014, the F-11C was a reward for completing the "Party Favor" Mission, that lasted until August 11th. Above average rate of turn vs it's fully upgraded tech tree counterparts (rated at 12.00. Grumman F2F rated at 8.7, Curtiss P-23 rated at 9.8, both with optimal upgrades). The 470 pound bomb is optional. The mounted 7.62 mm M1919 are shared with promotion premium Curtiss Hawk III. Tier IV Curtiss P-36-C Hawk "Promotion Aircraft"
At first glance, the P-36-C nearly matches the tech tree P-36 in almost every detail. However, the subtle differences between the two is a little more than just skin deep. Offered as part of the "Anniversary Bundle 1" during November, 2014. Equal hitpoints of the same tiered P-36 (with optimal upgrades). Slight edge in airspeed over tech tree counterpart. Very good rate of climb and turn time compared to upgraded P-36. Below average firepower (rated at 56. P-36 rated at 87 with top guns installed). Low operational altitude (rated at 900. P-36 rated at 1500, with optimal upgrades). The mounted 7.62 mm M1919-A4 (W) are shared with the Curtiss Tomahawk IIb. The mounted 12.7 mm M2 (S) is shared with Brewster F2A-1 Buffalo, Boeing YP-29, Curtiss Model 81A-1, Bell XP-77 and Curtiss Tomahawk IIb . The mounted 7.62 mm M1919-A4 (S) are shared with Curtiss XP-31, Boeing YP-29, Curtiss F11C-2, Curtiss Hawk II and Curtiss Hawk III. Tier VI De Havilland 98 Mosquito FB 26 "Promotion Aircraft"
The mighty "Mossy" in Chinese service. This Canadian built and exported Heavy Fighter becomes available as part of the "Anniversary Bundle 2" during November, 2014. Equal hitpoints of the same tiered British De Havilland 98 Mosquito (both rated at 370, with optimal upgrades). Slight edge in airspeed over tech tree counterpart (rated at 590. De Havilland 98 Mosquito rated at 566, with optimal upgrades). Slightly better firepower over same tiered counterpart (rated at 403. De Havilland 98 Mosquito rated at 399, with optimal upgrades). Low operational altitude (rated at 1800. De Havilland 98 Mosquito rated at 1950, with optimal upgrades). The mounted 20 mm Hispano Mk.II ( C ) are shared with De Havilland 98 Mosquito and De Havilland 103 Hornet. The mounted 303 Browning Mk.II ( C ) are shared with Bristol Blenheim F and De Havilland 98 Mosquito. The optional 500 lbs bombs are shared with Bristol Beaufighter, De Havilland 98 Mosquito and De Havilland 103 Hornet. The optional RP-3 SAP rockets are shared with Bristol Beaufighter, De Havilland 98 Mosquito and De Havilland 103 Hornet. 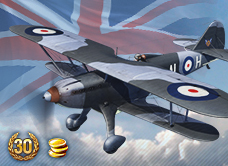 Tier IV Fairey Fantome "Promotion Aircraft"
Offered as part of the "Cyber Monday" bundle during December, 2014, this second premium tier IV biplane comes to the game, wearing British markings. Very good rate of climb and turn time. Below average firepower (rated at 72. Bristol 146 rated at 89, Arado Ar 197 rated at 124 with top guns installed). Below average hitpoints (rated at 110. Bristol 146 and Arado Ar 197 rated at 160 with optimal upgrades). Below average airspeed (rated at 222. 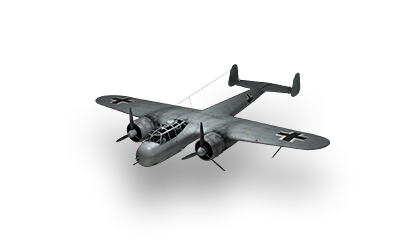 Bristol 146 rated at 241, Arado Ar 197 rated at 235 with optimal upgrades). The mounted 20 mm Oerlikon S9 (H) are unique to this aircraft. . The mounted .303 Browning (S) are shared with the Supermarine Type 224. Tier VII North American Mustang P-51K "Promotion Aircraft". Available in December 2014 as the "Wild Horse" premium shop package, the Mustang P-51K is, for all intents and purposes, almost the same plane as the tier VII P-51D Mustang. Much like a comparison between the lower tiered British Mustang to the American model, the Mustang P-51K gains an edge in better firepower and maneuverability, while the P-51D gains the turning and rolling advantages in top configuration. Above average firepower vs tech tree aircraft counterpart (rated at 141. P-51D rated at 125, with optimal upgrades). Slightly higher maneuverability then the same tier American Fighter (rated at 273. P-51D rated at 264, with optimal upgrades). Slightly below average dive speed vs tech tree aircraft counterpart (rated at 900. P-51D rated at 920, with optimal upgrades). Below average climb rate (rated at 22.1. P-51D rated at 21.3, with optimal upgrades). All mounted weapons are most effective at short range. The mounted 12.7 mm MG-53-2 ( W ) is shared with the Chance-Vought F4U-4 Corsair and North American P-51A/D/H Mustang. Edited by Quesnel, 25 December 2014 - 02:37 AM. Have you thought about adding descriptions of the 'exclusive' prerelease and tester planes? If I recall correctly they were only stated to be exclusive for a year this time around, so we may see them for sale in the future. And even if not, it would help people know what they're up against. EDIT: I see you've added them in since the original post. Edited by Blizzard36, 22 August 2014 - 10:03 PM. Starting with some of the aircraft from 1.1.0. Bare in mind, it's a work in progress. Edit: wrong thread, and I can't seem to find a delete post button. Edited by Adenil, 20 December 2013 - 08:09 PM. So of the new ones (excluding the GA) which would you pick if you could only have one? So enthusiastic! I've never flown it, but this piques my curiousity - how would YOU compare it to the P-40 (and others in tier)? For me, I prefer a "flexible" playstyle, a plane that can almost do it all, but not being exceptional at just being a "one trick pony". The old American Carrier line (Corsairs, Wildcats, Buffalo, etc) best suits what I think I am looking for. For me, it was a tough call between the XF4U-1 and the P-40 M-105 (Soviet Lend-Lease). Edit: yeah that was good advice it may not have as much firepower but in "dances" in the sky lol. Edited by oldkye, 20 December 2013 - 11:45 PM. I have the alpha tester premium craft, the XP-77 and Me 210. I'm thinking of gifting one of the new tier V premiums to one of my buddies so we will always have some credit-makers to make a flight with. Which ones would go best with either the XP-77 or Me 210 in a flight? My advice, find out which lines your "buddy" is grinding, and the planes they have fun/win the most in. Then decide if you would like them to either complement or contrast your two planes of choice.